The Blueair 203 is a newer, upgraded version of the popular classic Blueair 201. Great for bedrooms and offices, the Blueair 203 slim air purifier is able to clean up to 240 square feet of space in a matter of minutes. The Classic Blueair 203 slim can occupy tight spaces and is an ideal choice when you need a powerful filtration system but don’t want to deal with a large, bulky unit. It ensures efficient filtration combined with an attractive style. 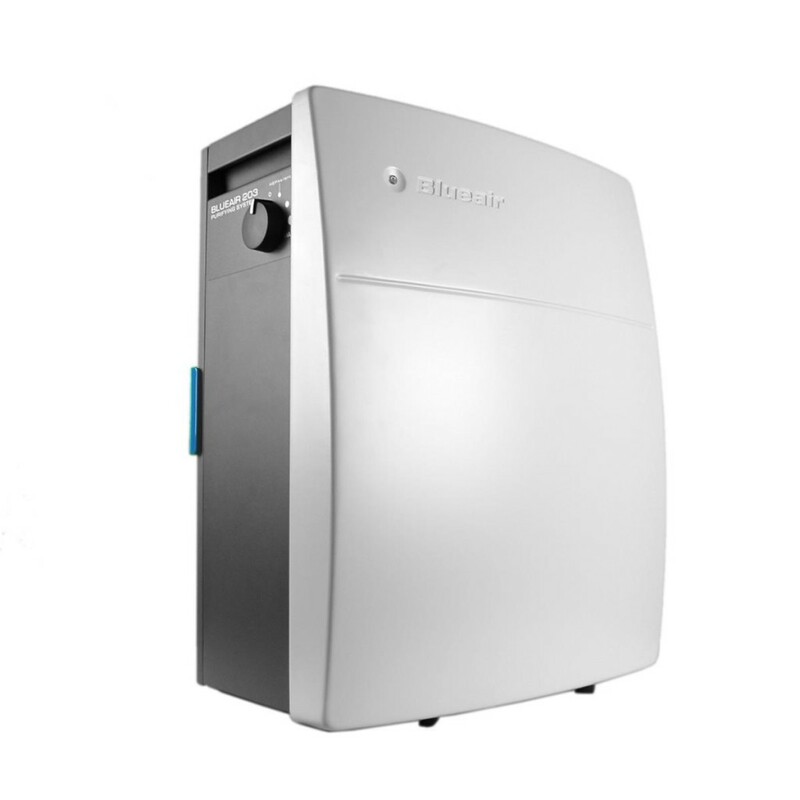 This AHAM-certified purifier has a Clean Air Deliver Rate (CADR) of 155 cfm. 1) It includes a magnetic filter timer that you can attach to your unit, refrigerator, or anywhere else you choose. With this timer, you will know exactly when you need to change the filter. 2) It comes with a HEPA Silent Air Filter that purifies even the smallest particles. The HEPASilent technology combines the best of electrostatic and mechanical filtration with its revolutionary advanced filter media and an encapsulated ion particle charging chamber that delivers pure air in a more advanced way than typical purifiers. 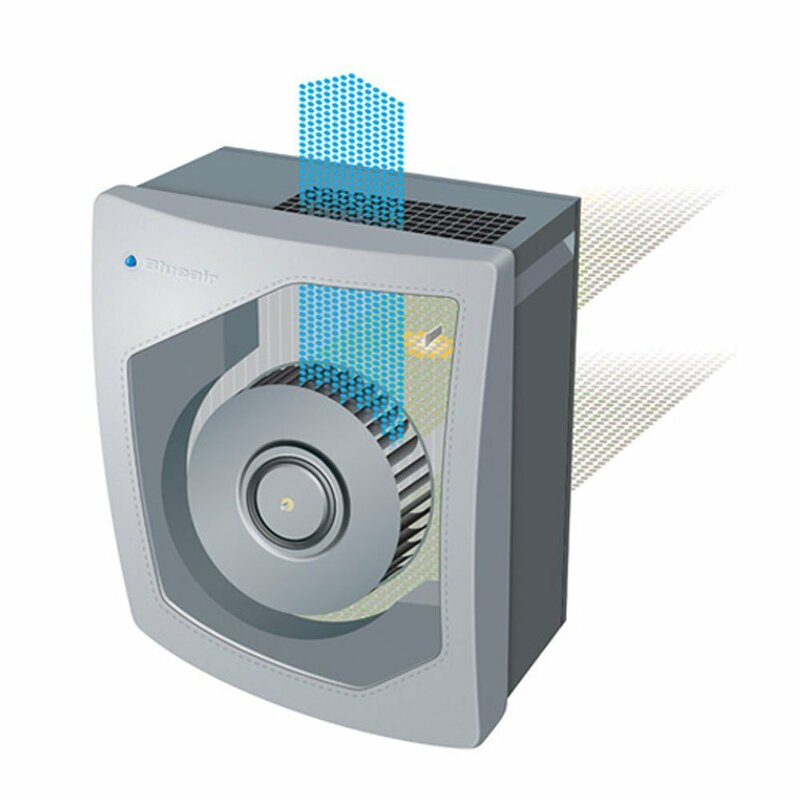 3) The HEPA Silent Technology filters more air faster than the competition. 4) Using less energy and producing less sound, the HEPA Silent air filter in the Blueair Slim 203 ensures the filtration and capture of 97% of harmful particles down to 0.1 microns in size. 5) The Blueair 203 is very small in build and can be easily transported between locations, weighing in only 25 pounds and 21” × 17” × 8” in size. 6) It captures 99.97% of harmful particles including dust, pet dander, smoke, viruses, bacteria, mold, exhaust fumes, and more. 7) Because of its construction, it will not release smelly gasses into your home. It is made with galvanized steel instead of plastic for maximum durability and smell-proofing. 8) It ensures zero ozone emissions. 9) It has 5-year limited manufacturer warranty. 10) Blueair 203 uses a progressive filter structure that resists loading and clogging which keeps filtration at peak performance levels. It allows maximum airflow while maintaining a rate of high efficiency. 11) The Blueair 203 air purifier is easy to maintain and its compact design is perfect for limited spaces. 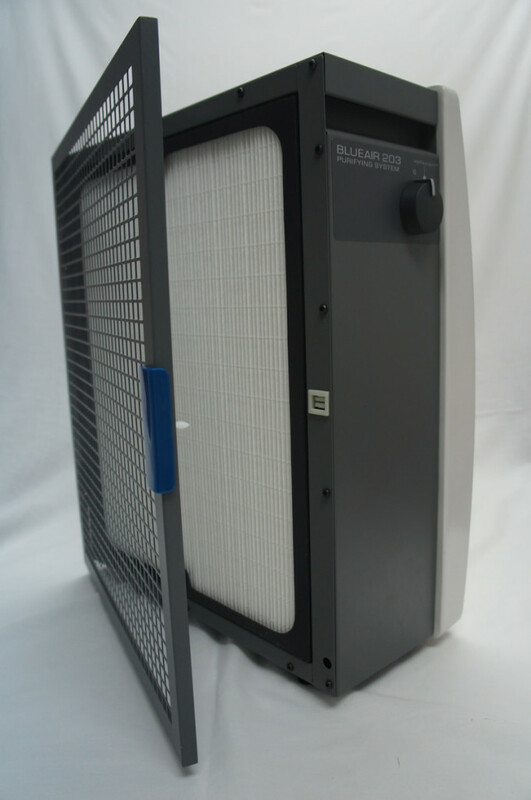 12) The optional gas and odor SmokeStop filter of Blueair 203 has 2 pounds of activated carbon to ensure adequate removal of gases, smoke odors, and VOCs. 13) It is one of the quietest air purifiers on our best air purifier for smoke list thanks to its unique HEPA Silent filtration technology. 14) The compact fan design of the Blueair 203 handles high-pressure airflow nicely, even for long periods of continuous use. 15) When you need to change the filter, just open the door on the back of the unit and replace the cartridge within a matter a seconds. The pre-filter traps the larger particles while air is passed through it. Then the electrostatic HEPA-type filter collects even the smaller particles with extreme precision. These combined filtration technologies allow the Blueair 203 slim purifiers to boast a 99.97% filtration efficiency. The Blueair Slim 203 is perfect for a small bedroom or office since it’s rated for up to 240 square feet. It does, however, lacks many of the features of the higher-end air purifiers such as an air-quality sensor or operation timer.